Why Cut Down Trees When They Can Be Translocated? Meet the Man Who Has Moved 5000 Trees This Way! Residents of Bangalore are up in arms about the proposed felling of 112 trees in the Jayamahal area to make way for a steel flyover to help reduce traffic congestion in the city. Is there no way in which these large, old trees can be saved from sure death? Urbanization and development are an inevitable part of living today. Road widening and building of flyovers has to happen in every city, but, this comes at the cost of losing green cover. Though transplantation and translocation of trees is an age-old activity the world across, it is rarely looked to as a solution before a tree is brought down. In 2009, when the Hyderabad-Vijayawada highway was being built, the existing road needed to be widened. A large number of trees were cut down for this and no one from the general public raised an objection. Moved by this unfortunate incident, Ramchandra Appari, a resident of Hyderabad, decided to do something to stop the indiscriminate felling of trees. “During a random conversation with a friend of mine in Australia I mentioned my feelings about this to him. 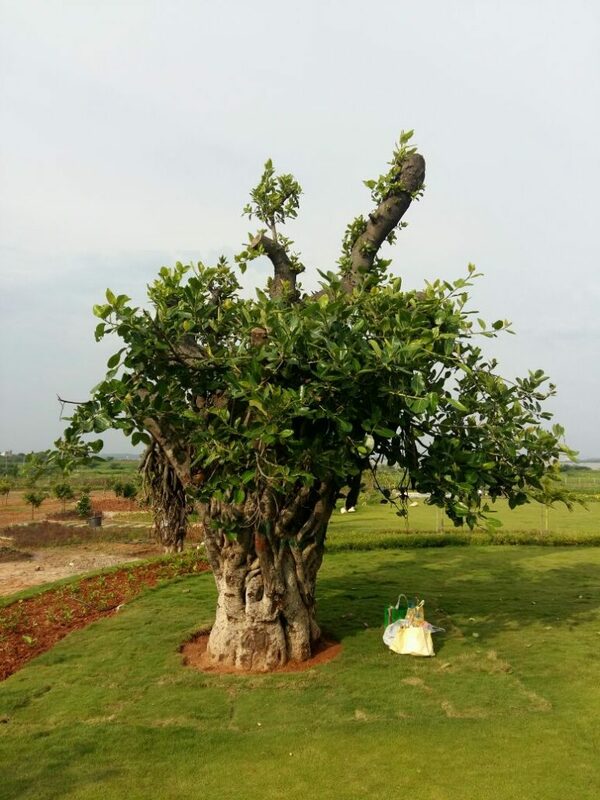 He introduced me to the idea of tree translocation and after doing a lot of reading about it, I set up the Green Morning Horticulture Services Private Limited, which offers professional help in landscaping and tree translocation,” says Ramchandra, the managing director of the company. While reading up and learning more about the process of tree translocation, Ramchandra found that knowledge about this practice has been around since 2000 BC. Ancient Egyptian pictographs depict men transporting trees, with their roots, in large containers. The Egyptians, supposedly transported large trees by ships from different parts of the world and transplanted them in Egypt. “It is indeed amazing that a solution to the felling of large trees exists with humans for many centuries now. It is heartening to know that in most countries, the world over, trees are not cut down but are instead translocated. However, for some reason, in India, this is not popular as yet,” continues Ramachandra. We all know that trees play a very important role in protecting the lives of all other living beings found around them. Uprooted tree, with roots packed, being moved by a crane. Most of our activities generate plenty of carbon dioxide and other harmful gases that pollute the atmosphere, and it is only trees that can convert these gases into oxygen and help counter the ill-effects. Trees take many years to grow and once fully grown, many species can live for more than a hundred years. The loss of even one tree in a vicinity can cause an imbalance in the natural wealth and health of the surrounding area. “In India, apart from Hyderabad, tree translocation is being done in certain parts of Gujarat and in Bangalore too. Trees like gulmohar, neem, jamun, mango, pepul and other ficus species can be easily translocated. To date, our company has translocated some 5,000 trees and we can easily say that we have achieved a success rate of 80%. The process is slow and takes time and what makes it expensive is basically the need to hire earth movers, cranes and trailers,” adds Ramachandra. Tree translocation is a tedious process, which has to be done very carefully. Once the tree is identified, the earth around the roots (at least 4 feet in diameter and depth) is dug and the roots are treated with chemicals to help in the transportation. 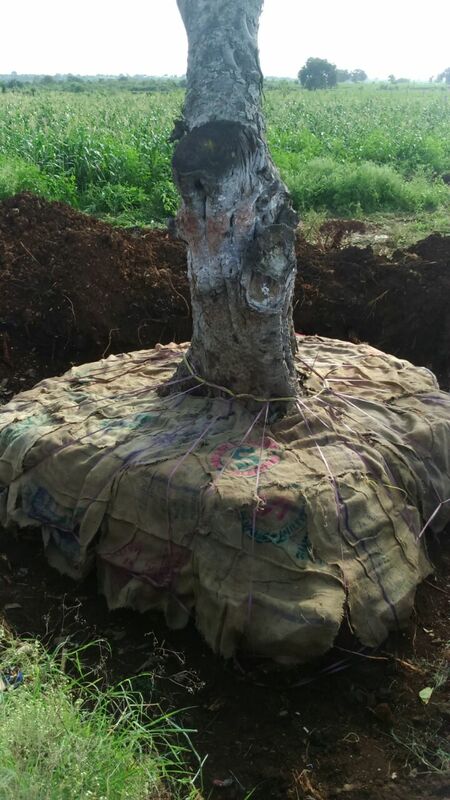 After a week the tree is lifted with a crane and the roots are packed up in a large jute bag, making a root ball out of them. A tree being lowered into the trench in the new location. The tree with most of its branches pruned, is then transported in a trolley to the new place, where a root ball trench has already been made and the soil has been treated with anti-pest and anti-disease chemicals. The tree is planted in the new trench, and for the next couple of months requires close monitoring. 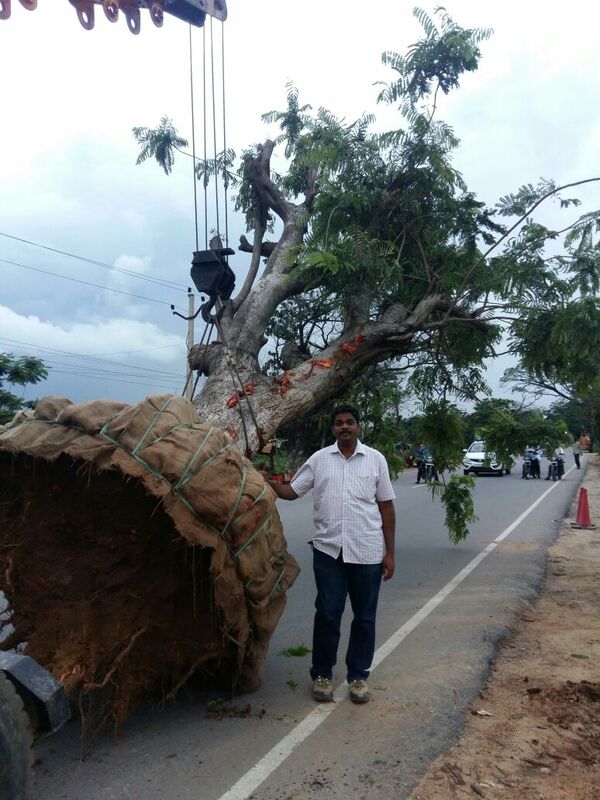 Recently, in the stretch planned for the Hyderabad Metro Rail, around 800 trees had to be translocated. This major project was taken up by the company and almost all the trees are thriving in the new locations. 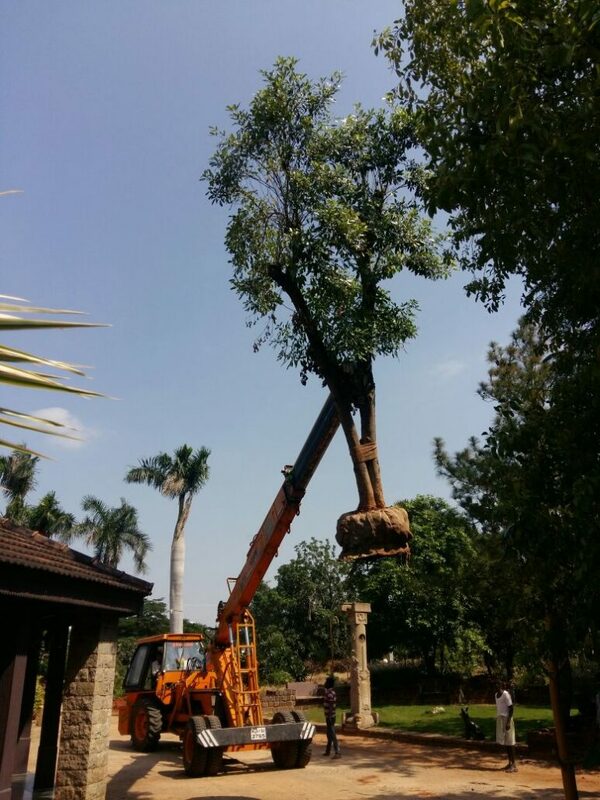 To try and maintain some sort of balance in the vicinity from where a tree has been uprooted, the company generally tries to plant the uprooted tree as close to the place where it has been uprooted from. However, if this is not possible, a 5-year-old tree is planted in the vicinity and the full grown uprooted tree is planted elsewhere. A ficus tree translocated to a large garden. “The expenses for translocation of the trees mainly depends on three factors: the size of the tree, the number of trees that the client wants to translocate and the distance from where the tree is being uprooted to the place where it has to be replanted. We have once charged Rs. 6,000 for a 15-year-old tree and even charged Rs. 1.5 lakh for a 100-year-old one,” says Ramachandra. With cities across the world rapidly losing green cover, there is an urgent need for more research on the viability of tree translocation, and it is becoming increasingly important that we take steps to save each and every full-grown tree. For more details contact Mr Appari at ramachandra.appari@gmail.com. About the author: Aparna Menon is a freelance writer, writing for various newspapers for the past 10 years. Her main fields of interest are wildlife, heritage and history. A keen traveller, she loves to read and write and does a lot of art work too. I am a tree lover in Mumbai it is normally see that the trees are purned from only one side,Atree is a Tshape structure,when purned from one side the balance is disturbed leading the tree to fall on the other side,it should be mandatory that the BMC or other concerned person should note this point and help save our trees.